Writers and scientists throughout history have searched for an apt technological analogy for the human brain, often comparing it to a computer. For Pulkit Grover, Carnegie Mellon University assistant professor of electrical and computer engineering and the Center for Neural Basis of Cognition, this analogy couldn't be more fitting. Although Grover and his research team spend much of their time exploring how information flows through computer networks (such as coding systems, cyberphysical systems, and low-power wireless systems), they also apply these information theory principles to brain-imaging systems. This cross-disciplinary research approach bridges mathematical theory with clinical applications—striving to improve the treatment of neurological disorders such as epilepsy. "It is exciting to be applying my research in the neuroscience and neuroengineering space because I am tackling information theory challenges that have the potential to impact the quality of life of patients, or make a doctor's diagnosis faster and easier—that is the goal I'm always working toward," says Grover. Grover and his research team have been focused on improving the resolution of EEG neural imaging technology, a portable and non-invasive brain imaging system. This research goes against the trend in the field of neuroscience. Many researchers believe that EEG systems are fundamentally limited to imaging resolutions that are too low to be effective, and that it is impossible to improve the resolution of these systems beyond their current levels. "The current overarching view in both clinical and neuroscientific communities is that a different imaging modality needs to be invented. However, it is our view that the potential of EEG has been severely underestimated, and that EEG's low resolution became a self-fulfilling prophecy of sorts," explains Grover. "We are working towards building the first 'Ultra-Resolution EEG' platform. This platform offers important benefits that no other modality currently has, such as high spatiotemporal imaging resolution, while still being portable. It is also more than ten times cheaper than other imaging technologies such as MRI or Magnetoencephalography (MEG), which is important for doctors who will be using this for the treatment and monitoring of their patients." 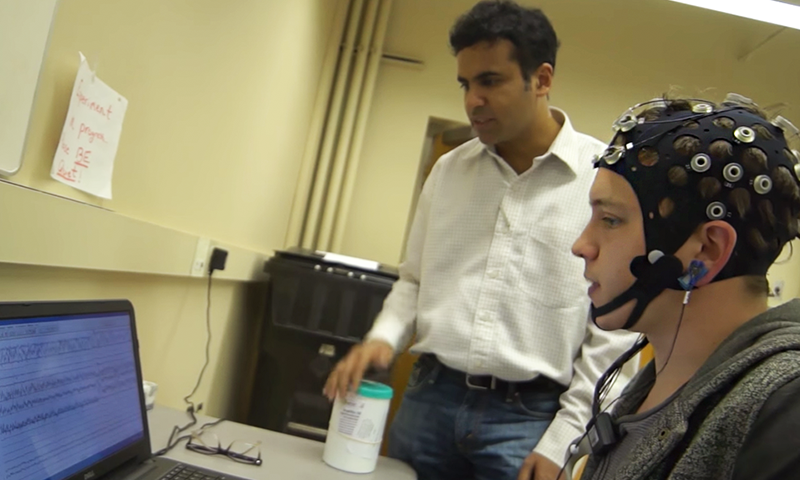 Recently, Grover and electrical and computer engineering Ph.D. student Praveen Venkatesh established the first-ever fundamental limits on EEG imaging, and showed that the reason that most neuroscientists believe EEG has inherently low-resolution is incorrect. These limits show how an earlier study was misunderstood at-large in the field to suggest that low-density systems (with a hundred or so electrodes) obtain the best possible imaging. Grover and Venkatesh explored the question of how many electrodes should be used in this system to provide the best imaging results. 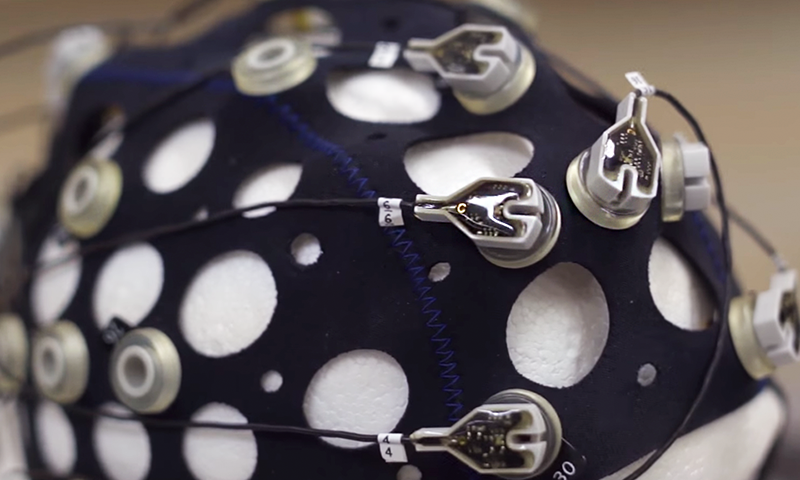 "If you improve both the data analysis and the number of electrodes for EEG systems, then you can improve the resolution dramatically," says Grover. "This new theory lays the foundation for exciting experimental work with our Carnegie Mellon BrainHub collaborators. The study, titled "An information-theoretic view of EEG sensing," was published in the Proceedings of the IEEE. The research was conducted as part of Carnegie Mellon's BrainHub, a university initiative that focuses on how the structure and activity of the brain give rise to complex behaviors. Grover and Venkatesh are collaborating extensively across the university to validate these fundamental results and bring them into practical systems. Their collaborators include Marlene Behrmann and Michael Tarr (professors of psychology and the Center for Neural Basis of Cognition), Shawn Kelly (senior systems scientist in the Engineering Research Accelerator), and Jeffrey Weldon (associate professor of electrical and computer engineering). They are also working with Mark Richardson, an epilepsy neurosurgeon at the University of Pittsburgh, to obtain clinical validation and establish relevance in epilepsy. The collaborative team published experimental validation of some of this work at the 2016 Information Theory and Applications Workshop. "To change the widespread perception of EEG technology and get these systems into clinical practice, we need more experimental validation of this theory," Grover concludes. "We are well on our way to getting these validations and I'm looking forward to what the future holds for this research."